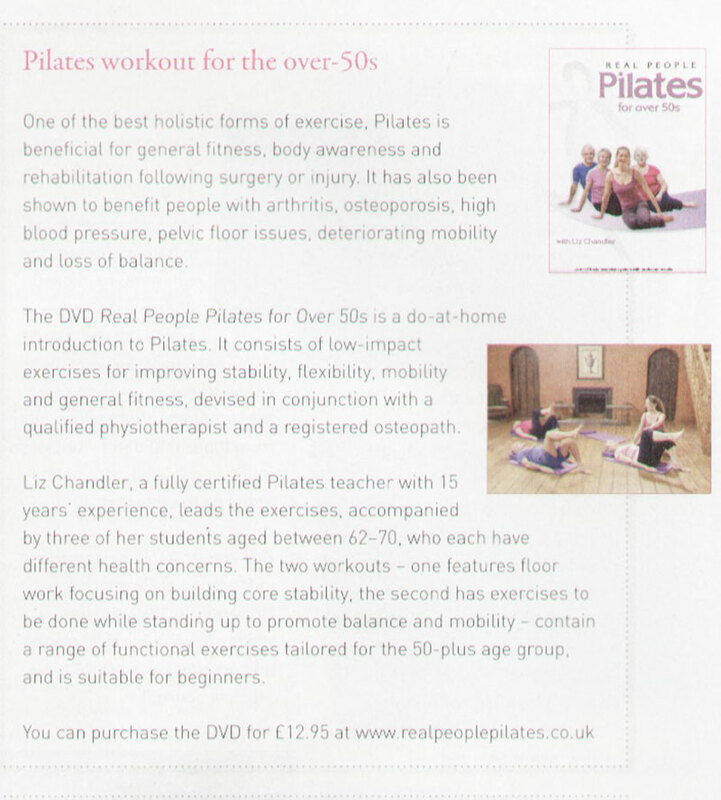 Our first production, Real People Pilates for over 50s has been very well recieved in local and national publications. My Weekly magazine has a leader article on the benefits of Pilates in January 2016, in which Liz writes about the benefits for all ages. Saga Magazine, the UKs bestselling monthly magazine has featured us, calling Real People Pilates for over 50s the best video for promoting mobility. Townswoman magazine featured our DVD in their article in the January-March 2010 staying active issue. Women's Health Magazine have featured our DVD and recognised Pilates as being beneficial for general fitness, body awareness and rehabilitation following surgery or injury. Yours Magazine featured us in their health matters special. Choice Magazine ran a 3 page feature article in their health section. Active Life Magazine featured our DVD and gave their readers a chance to win a copy. Somerset Life Magazine. Liz wrote an article for the magazines health section explaining how Pilates can help you maintain a full and active lifestyle in your later years. BBC Radio Shropshire featured Liz in an interview talking about the DVD and benefits of Pilates. Cambridgeshire Journal reviewed the DVD and wrote a review. Unite Magazine featured our DVD and gave their readers a chance to win a copy.